Well it’s been a while! But I suddenly came upon some extra time on my hands so thought doing a little writing might be a good, therapeutic use of that time. 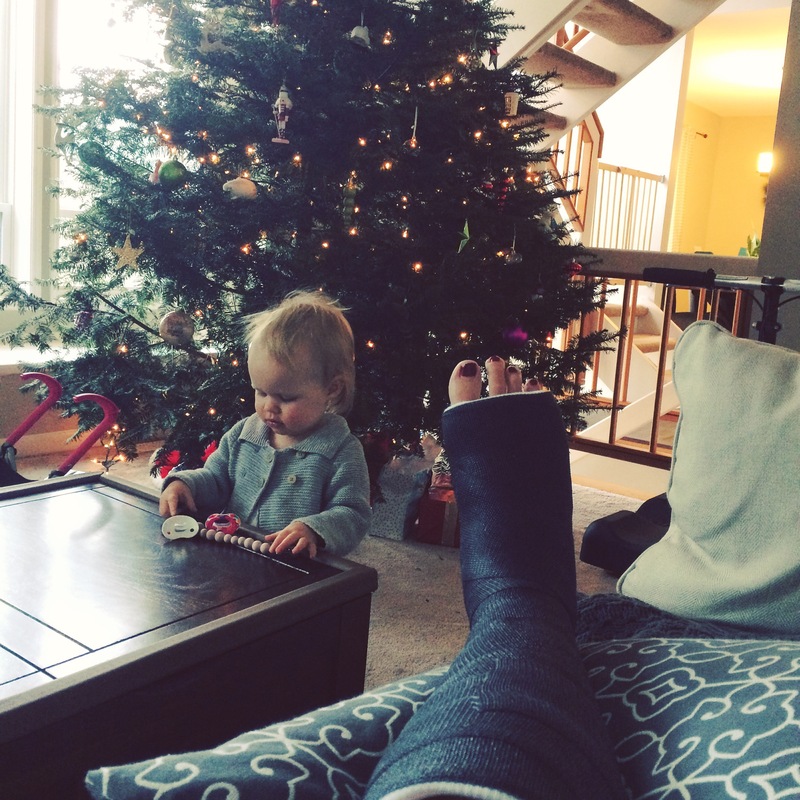 One week ago I slipped and fell on a play date with my little one and broke my ankle! So 4 days ago I had a cast put on and found out I cannot put weight on it for at least 4 weeks. To add to that fun, I am currently 26 weeks pregnant with a 17 month old running around at home. Talk about complicated. And a bummer! Christmas is just about a week away and we were supposed to fly to Minnesota in a few days to spend the holiday with my family. We thought it might be the last time we’d go back for the holiday for a while with the impending arrival of our new baby boy and the craziness that comes with a growing family. Now it looks like we will probably not be able to go. The disappointment surrounding that hasn’t even hit me. I’ve been trying to take one day at a time so as not to get too depressed about my inability to do anything around the house- primarily take care of my daughter, which is my full time job! It is SO hard to do nothing when you are used to doing everything. My inlaws were able to come up for this week and help out which has been such a blessing. And I have another family member coming to help for two days next week and then the husband will be home because of the time he took off for our trip. So at least we’ve got support figured out for the next week. There is no possible way I could do it myself (which right there is extremely difficult to admit because I always try to be superwoman doing it all). As I try to find the silver lining in all of this, I am reminded that my injury could have been worse and that this is only temporary. Also that we are lucky that baby boy is still in my tummy growing and healthy, and this would be even more challenging if he was already born! And lastly, sometimes it is good to be forced to slow down and take life day by day, and to notice the many loved ones who will go out of their way to help out a friend in need. There ARE good people in the world, and many of them are right in my small section of the world. And for that, I feel ever so blessed.